Bathukamma festival is truly a reflection of Telangana's cultural identity. Bathukamma means ‘come back to life mother’. Epics say that Sati (Gowri) returned as Goddess Parvati and therefore the festival is also dedicated to Goddess Parvati. Bathukamma is colorful floral festival of Telangana culture celebrated by Telangana women. This festival is celebrated in the honour Goddess Gowri in the name of Bathukamma where the women seek her blessings for prosperity and good health. Bathukamma in Telangana begins in the mid of every monsoon and before the onset of winter, it starts with Mahalaaya Amavasya also called as Pethara Amavasya in Telangana. 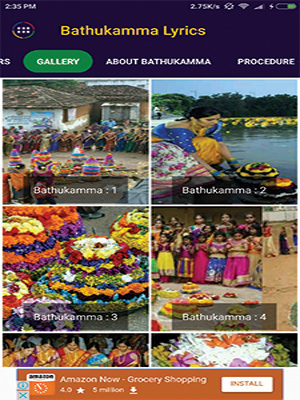 Bathukamma is celebrated for a period of nine days, initiates with Engili Puvvu Bathukamma and closes with Saddula Bathukamma by immersing Bathukamma nearby water bodies. Telangana women begin making of Bathukamma after the afternoon of each day. During these nine days of celebration, on each day women prepares two Bathukamma’s one big and other small. Women also make 'boddemma (gowramma) which is made from the turmeric paste along with Bathukamma and placed on top of conical flower arrangements that signify both life and eternity in their colours. Nine days of Bathukamma festival celebrations turns out in the evening times where women’s and young girls dress colourfully in Telangana traditional manners and gathers in any local clset open areas with their Bathukamma’s and places their Bathukamma’s in centre of the ground. All women and young girls forms as circle around Bathukamma’s and starts singing Bathukamma songs by clapping their hands in rhythmic manner and revolves around the Bathukamma’s. This circle formation gives splendorous traditional looks to Bathukamma festival. Sixth day falls on the Panchami/fifth day of Ashwayuja Masam. No food offering is made on this day. Seventh day falls on the sashti/sixth day of Ashwayuja Masam. Naivedyam/ Food Prepared: Rice flour shaped into the fruits of Neem tree is deep fried. Eight day falls on sapthami/seventh day of Ashwayuja Masam. 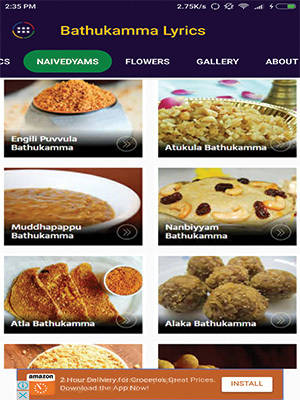 Naivedyam/ Food Prepared: A kind of sweet prepared from sesame ingredients includes Sesame (Nuvvulu), Jaggery and Ghee. Naivedyam/ Food Prepared: Five types Variety of rices prepared on the final day of Bathukamma celebrations Curd rice (Perugannam saddi), Tamarind rice (Chintapandu Pulihora), Lemon rice (Nimmakaya saddi), coconut rice ( Kobbari saddi), sesame rice (Nuvvula Saddi). Awesome celebrations are carried out on the final day of Saddula Bathukamma, on this day ultimate huge massive size of Bathukamma’s were made which is a traditional art of Telangana.. The women decorate a small steel or brass platform called Thambalam with colours and then the variety of the flowers as the Gunuka, Tangedi, Lotus, Alli, Katla, Teku, the Gourd flower etc are arranged in a circular fashion in layers to make a conical arrangement of the flowers enriched with a Lotus or Pumpkin Flower on top of the stack alongside Gouramma (a symbol of Gowri idol made of turmeric). 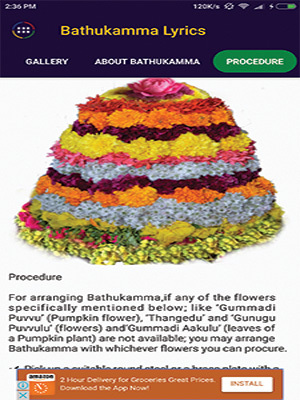 The conical arrangement of the flowers signifies the mother goddess and is called the Bathukamma. On the last day of the festival, Saddula Bathukamma, women assemble at a common place near to water bodies placing the conical stacks or Bathukamma’s at the centre then dance around it singing their traditional songs and clapping in unison. Women and young ladies dance around the Bathukamma with a circular pattern by clapping their hands with an outstanding popular rhythm of “Bathukamma, Bathukamma vuyalo..… “. Just before the dusk, the women with their Bathukamma’s and gowramma, both were immersed in the lakes and ponds. After the immersion the women exchange the traditional Sindoors and sweet called ” Maleeda” which is prepared by sugar and corn bread with other and family member’s. When we see the Bathukamma’s floating in the water bodies, the water bodies appear they have been decorated with the various colorful flowers. 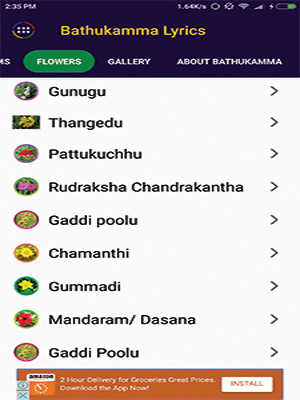 The flowers which are used in making of Bathukamma, especially Tangedi Puvvu have exceptionally great quality of healing and cleaning the water bodies such as lakes and rivers.